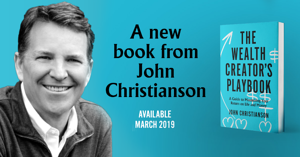 JC: I’m John Christianson and I’m the author of The Wealth Creator’s Playbook: A Guide to Maximizing Your Return on Life and Money, host of The Wealth Confidant podcast, and the Founder and CEO of Highland®, a financial life management firm located in Bellevue, WA. SC: What inspired you to write The Wealth Creator’s Playbook? JC: For the past 25 years, I have advised some of the most successful wealth creators in the country. I’ve learned that wealth provides tremendous advantages, but it also creates challenges and complexities that many don’t expect. For example, communication problems with a spouse/partner about financial priorities, fear of raising entitled kids, strained family relationships around financial support, and emotional problems like depression, loneliness, identity issues, and isolation. My goal is to inspire people to create a truly wealthy life, and not to focus exclusively on money as the sole definition of success. This book is unique because there are many books about making and managing money, and about life planning, but few that address the intersection of money and life, including tools and resources to create your own definition of life fully lived. SC: Who did you write this book for? JC: I wrote this “playbook” for anyone who wants to win at the game of life and money, and to help wealth creators shift their thinking from managing to maximizing their money. You might be a current wealth creator; aspire to create wealth one day and still early in your journey; a future wealth beneficiary through inheritance or a sudden wealth event; or the spouse/partner of a wealth creator, experiencing a co-creator role. This book is written with people all along the spectrum of wealth creation in mind. SC: What do you hope people will get from The Wealth Creator’s Playbook? JC: I wrote this book to help people benefit from the lessons I’ve learned in my own journey and in my role as wealth confidant: to define success more broadly than just money; to provide a pathway for finding meaning and purpose; and to experience more joy, contentment, and freedom in and through money. By examining and understanding your emotional relationship to money, which I refer to as your Money EQ, you can improve downstream behaviors around money choices. Money EQ includes your attitudes, beliefs, experiences around money, as well as your money history. I’ve created a free online tool to help you assess and improve your money emotional quotient which can be found at www.moneyeq.com. SC: The book sounds amazing. Where can we find out more? JC: Visit www.jcchristianson.com to access information about me, the book, the podcast, and other resources and tools for creating a truly wealthy life. The book is also available for purchase on Amazon (traditional, Kindle, audio versions available) here. Subscribe to The SCoop here!